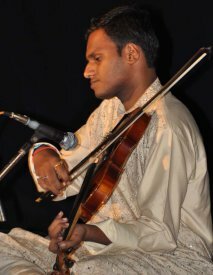 Like the resonating strings of the violin, he gave lifelong support to the music and dance of Odissi. Unsung and unheralded, he tirelessly worked to create a compatible music for the likes of Kelucharan Mohapatra, Sanjukta Panigrahi, Kumkum Mohanty and countless others who had also spent a lifetime in the service of Odissi dance. 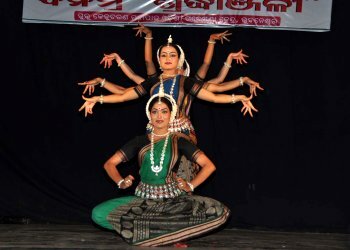 In the strenuous process of resuscitating the dying tradition of the classical dance of Orissa, it is impossible to imagine the system of neo classical dance without the sustained support of its musical accompaniment and compositions. Choreography is incomplete without an inspired music to lift it to great heights. And the invaluable work of stalwarts like Guru Kelucharan Mohapatra and all his eminent disciples would have been incomplete without the masterly inspiration of the musical genius of yesteryears – Pt. Bhubaneswar Mishra. And it is the tragedy of modern times that while the vast body of music which Pt. Bhubaneswar Mishra created continues to be used today in numerous dance performances, its brilliant creator has been forgotten almost completely and is remembered briefly and tentatively on his 17th death Anniversary. This Anniversary was held on 7th May 2010 at the Utkal Sangeet Mahavidyalaya auditorium under the auspices of Guru Kelucharan Mohapatra Odissi Research Centre, an institution which Pt. Bhubaneswar Mishra along with Guru Kelucharan Mohapatra served passionately for many years without expecting any substantial returns. Their reward was in the fact that Odissi dance and its beautiful handmaiden - Odissi music - was welcomed not only in many parts of India but also in many parts of the globe as an aesthetic experience cherished by its devotees and held in high esteem by audiences who cared for traditional art forms and the culture that nurtured them. Pt. Bhubaneswar Mishra died 17 years ago at the very young age of 66; but amongst us and all who are inspired by Odissi dance and music, he continues to be a living and vibrant presence. In his compositions, in his ability to blend attractive musical ideas to classical Odissi choreography, in his deep devotion to the twin arts of producing heavenly music from his violin and composing equally unmatched music for the 'Lasya' laden temple dance of Orissa, the abundance and the beauty of his music is incomparable to anything that has come before it or may come in the future. The freshness of imagination, the rigour of application, the years of toil and the love and respect that he received from a generation of gurus, dancers and audiences, make him a hero with his very own and special persona. At the pinnacle of achievement, he has occupied a place which none can reach, and earned a stature that would be a distant dream for lesser mortals. Thus, in the consciousness of Odissi dance and music, a truly immortal being. The man himself overcame, in his personal world, heart-rending tragedies that dogged him through the major part of his life. His first son suffered from a severe mental condition. As if this was not enough, life dealt another cruel blow. On a train journey along with him, his younger daughter fell from the train and lost her life. Panditji immersed himself in music throughout his waking hours; his response to life's grim tragedies was to produce more and more music of increasingly better quality. In the process, Bhubaneswar babu became the most prolific composer of music for dance as well as for the Radio in the genre of Sugam Sangeet (light and semi classical musical forms). As early as 1967, he joined the Akashvani (All India Radio), Cuttack, as a violinist, accompanying scores of singers and other musicians in a variety of Radio programmes. 10 years of producing exceptionally good music earned him a promotion as Assistant Producer, which in those days, was a high post with lots of responsibilities and respect. Soon thereafter, he was rewarded with the designation of Producer which gave him unlimited scope to not only to oversee the creation of quality music but also to cast his creative influence on a large number of aspiring singers and musicians. During this period, the highly popular light music programme called Saja Phula was begun; its unforgettable melodies have continued to delight a huge number of Radio listeners in Orissa for decades. The key to Panditji's enormous success as a music composer lay in the eclectic education in music that he had striven to acquire in both the noted streams of Indian classical music - Carnatic and Hindustani. He abandoned formal schooling in preference to a long stint in the highly acclaimed institution - the Maharaja Music College at Vizianagaram, Andhra Pradesh. Under the tutelage of the revered guru Dwaram Venkataswami Naidu, he got the opportunity to mould his latent obsession and talent in classical music. Subsequently, in 1973, his exposure (at All India Radio, Bombay as producer for the nationwide Vividh Bharati programme of song and music) to a number of musical greats like Vinayakrao Patvardhan and DV Paluskar kindled deep interest in Hindustani music. His enthusiasm for Hindustani and Carnatic classical music systems had already been bolstered by an abiding love for Odissi music which he had absorbed from stalwarts such as Singhari Shyamsundar Kar and Kabichandra Kalicharan Patnaik of Orissa. Thus Panditji's fine musical imagination was embellished by a number of musical influences and these influences played an important part in creating a rich variety of music coloured by multiple hues and styles. A careful study of the vast body of music produced by Pandit ji would reveal lingering traces of the seminal classical music of India as well as the pleasant influence of Western classical sensibilities and Odissi music, too. The direct beneficiary of his devoted efforts in Odissi music was the GKCM Odissi research Centre, an institution which he served for almost a decade from 1984 onwards. The institution's archives are a treasury of some of his finest compositions and violin pieces played by him. And it is in the classical Odissi dance that Pt. Bhubaneswar Mishra has left an indelible imprint of his genius and his vitality. As a composer of Odissi music, his long association with Guru Kelucharan Mohapatra has produced a stunning array of beautiful choreography. The range and richness of Guru Kelucharan's ideas in dance found perfect support from the very empathetic understanding of both dance and music that Bhubaneswar babu had cultivated in himself with such dedication. If Guru Kelucharan is unambiguously heralded as the founding father of neo classical Odissi dance which has established footprints all over the world, it is difficult to imagine what form and shape his wonderful choreographies would have taken, without the beauty and variety of Bhubaneswar babu's music. In my growing years, I have been extremely fortunate to witness the marvellous rapport that existed in the working relationship of these two men. A single nod or glance from my father Guru Kelucharan, was adequate enough communication for Bhubaneswar babu to alter a note or add a twist to an intricate passage of music. This deep understanding of each other's artistic sensibilities has helped to create to large body of time honoured dance music many of which are in use today, three decades after they were made! Landmark compositions like Shankaravarana Pallavi (1965), Aravi Pallav (1972), Hansadhwani Pallavi (1978), Khamaj Pallavi (1979), Bhagavat Gita (1979), Kirwani Pallavi (1981) and many others have been used by literally hundreds of Odissi dancers worldwide. Their freshness and appeal has not faded a whit over such a long passage of time: my memories, too, of night-long composition sessions have frequently reminded me of those marvellous times when the miracle of Odissi choreographies and performances unfolded before my eyes. Especially memorable times have been the occasions when new compositions were being born and I was given the opportunity to stand behind, and follow the senior dancers for whom these compositions were created. This was a priceless part of my own grooming as a dancer, and I have been blessed in having played a humble part in the grand scheme of things whenever Pt. Bhubaneswar Mishra and Guru Kelucharan Mohapatra sat down to assemble these compositions, line by line. The discussions that took place between the choreographer and the music composer revealed to me, a magical world of sound and expression that went into forming the vast reservoir of knowledge and creativity that these two great men have gifted to the world of dance and music. I cannot resist sharing, with my readers, the very special occasions when Kirwani Pallavi was made for Kumkum Mohanty and Khamaj Pallavi was made for Sanjukta Panigrahi. This was as far back as 1978 and 1979 respectively. The choregraph, Bhagavat Gita was also constructed in 1979 as a solo item for Kumkum Mohany and later modified into a duo item for Kumkum Mohanty as Krishna and Sanjukta Panigrahi as Arjun. In a subsequent development, I was given the role of Arjun to dance with Sanjukta Panigrahi in the role of Krishna in the same choreograph. For me, it was an invaluable experience, both as a witness, and as a participant / dancer in Odissi's core group of eminent artistes – Guru Kelucharan Mohapatra, Pt. 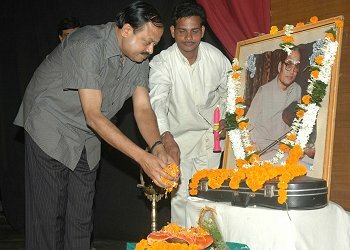 Bhubaneswar Mishra, Rakhal Chandra Mohanty (singer & composer), Kumkum Mohany, Pt. Raghunath Panigrahi (singer & composer of the 'Gita Govinda' fame) and Sanjukta Panigrahi. I have mentioned these episodes with the purpose of sharing, with my readers, both my enthusiasm and my sense of awe at the wonderful things that were happening to me during my teenage years. The twin gifts of music and dance have been a double blessing for someone as young and impressionable as I was. This is an extremely rare privilege. I am fortunate that Pt. Bhubaneswar Mishra was such an important part of my upbringing. Panditji was born 83 years ago on 15th July 1927! And on his 17th death Anniversary on 7th May 2010, many of us who have witnessed his work in the evening of his life, dearly wished that he had lived for many more years. His music had unmatched beauty and the man himself had an unmatched strength of purpose. And these two sentiments stood out among the numerous accolades paid to him on his Anniversary function which was inaugurated by Debi Prasad Mishra, the Minister of Culture, Orissa. The speakers for the occasion were Gurukrushna Goswami (lyricist), Swarup Nayak (lyricist, singer & composer), Shantanu Mahapatra (music director), Govind Tej (film director), Pranab Patnaik (playback singer), Muktilata Pal (Odissi dancer), and this reviewer. The Minister, while accepting the request for a statue to be erected in honour of Pandit ji, also emphasized that he would coordinate efforts to highlight the genius of Pt. 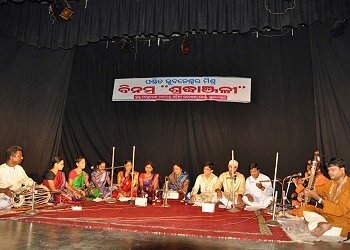 Bhubaneswar Mishra through a number of musical events to be staged in major cultural centres of India. The other speakers also felt that recognition and acknowledgement of Panditji's work were long overdue, and sincere efforts were needed to honour this eminent son of Orissa. An archival film on Panditji highlighting his accomplishments was also shown. The cultural programme began with a chorus composed by Pt. Bhubaneswar Mishra and sung by 8 members of the Guru Kelucharan Mohapatra Odissi Research Centre - Ajay, Rajat, Subasis, Ritanjali, Anupama, Manju, Lily and Sashi. This Sargam Geet was based on 'Maaheswari', a Raga created by Pt. Bhubaneswar Mishra himself. Spanning 10 minutes, the entire song was rendered in sargam patterns in Tala Ekaali, and the cascading swaras were one more pleasant reminder of the melody and variety inherent in all of Panditji's compositions. This unusual item was rendered faithfully and confidently by the singers of GKCM Odissi Research Centre who were guided by the noted singer Lata Ghosh. With equal proficiency, the choral group presented an Oriya song 'Kalandi kulaku mora sankhali na ja re.' Popular in the southern districts of Orissa, this traditional Oriya song in Raga Kalyan and Tala Jati was rearranged by Panditji and the chorus was guided by Guru Keshab Chandra Rout. A noteworthy feature was the solo violin recital by Sarada Prasan Das. Though young, Sarada showed a confidence much beyond his years. With the degree of skill in his finger work, it is evident that he will become a major musician in the classical circles. Also pleasing was the Tabla accompaniment by Sandeep Rout. The Raga performed was Jog. 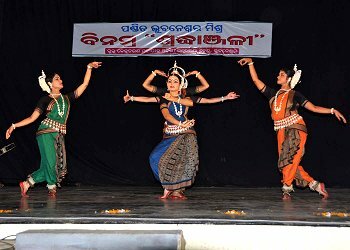 This was followed by a presentation of the complete repertoire of classical Odissi dance – Mangalacharan, Batu, Pallavi, Abhinaya and Mokshya. All of them have been choreographed by Guru Kelucharan Mohapatra and with the accompanying music by Pt. Bhubaneswar Mishra. The first item, which was basically a Mangalacharan in Raga Shankaravaranam, had an interesting feature. A Pallavi in the same Raga was skillfully dovetailed into the Mangalacharan choreograph. This group item was presented by 6 members of Srjan (Bijaylaxmi Satapathy, Rajashri Praharaj, Manosmita Panda, Rachna Rimjhim, Swagatika Sahani & Kaustavi Sarkar), an institution which is the holder of Guru Kelucharan Mohapatra legacy. The next item was 'Batu' in Raga Bhupali and presented by 4 members (Pallavi Das, Rojalin Srichandan, Mamatarani Upadhyay & Shikha Patnaik) of the GKCM Odissi Research Centre. The 'Batu' is always a difficult item and needs sustained, all round preparation. The following item, the third dance of the evening was a 'Pallavi' set to Raga Kirwani. Yet another example of the masterly work done by the duo – Guru Kelucharan Mohapatra and Pt. Bhubaneswar Mishra. The dancers were Manoranjan Pradhan, Minati Dasgupta and Munmun Chakrobarty. The fourth item was an Ashtapadi from Jayadev's Gita Govinda – 'Shakhi he Keshi mathana mudaram,' an abhinaya set to Raga Mishra Pahadi and danced by Sujata Mohapatra. 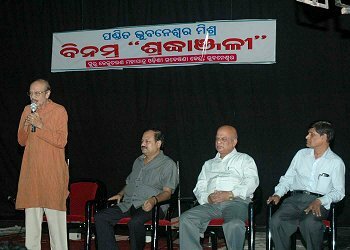 The concluding item 'Mokshya' in Raga Bhairavi was presented by Sujata Mohapatra, Manoranjan Pradhan, Minati Dasgupta and Munmun Chakraborty. A pleasing performance by all four dancers and a fitting finale to the Anniversary function, which was arranged by Sangeeta Gosain and the members of GKCM Odissi Research Centre. Pt. Bhubaneswar Mishra was a blessing for Odissi dance and music. People like him are not frequently seen. In spite of the collective loss of memory regarding this truly great and talented human being, it goes to the credit of Sangeeta Gosain and GKCM Odissi Research Centre that he is remembered with the reverence and affection that Panditji richly deserves. The Anniversary is religiously held every year to mark the day of his passing and the event is organized with the energy, efficiency, and enthusiasm that is visible in Sangeeta Gosain as an endearing characteristic. Similar enthusiasm was shown by all the participants and artistes who hold the memory of Pt. Bhubaneswar Mishra dear to their hearts.